It may be fitting that this episode was basically an OVA. It really didn’t have the usual charm or enjoyment of a regular Natsume episode. 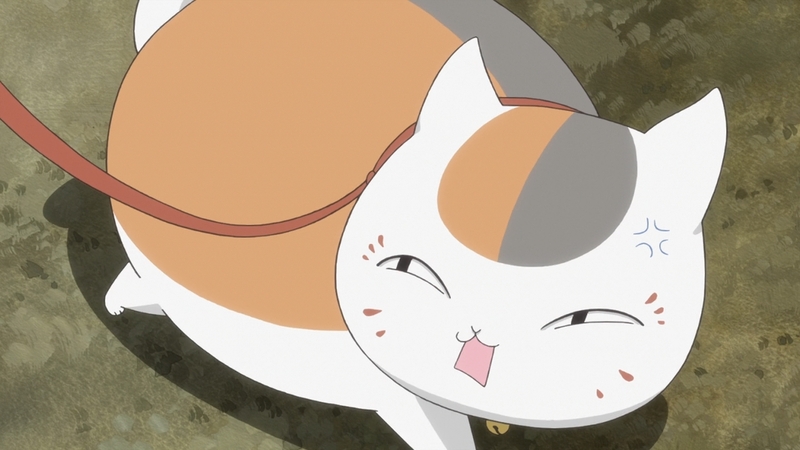 I actually don’t mind focusing on Nyanko-Sensei as he is one of the best characters in the show. 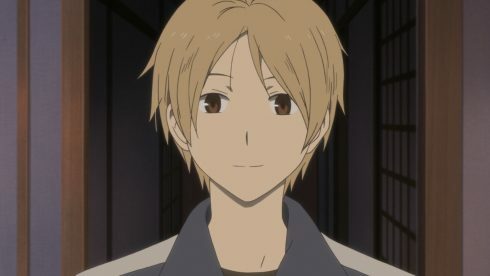 Even stepping away from Natsume himself isn’t necessarily a bad thing to do on occasion. 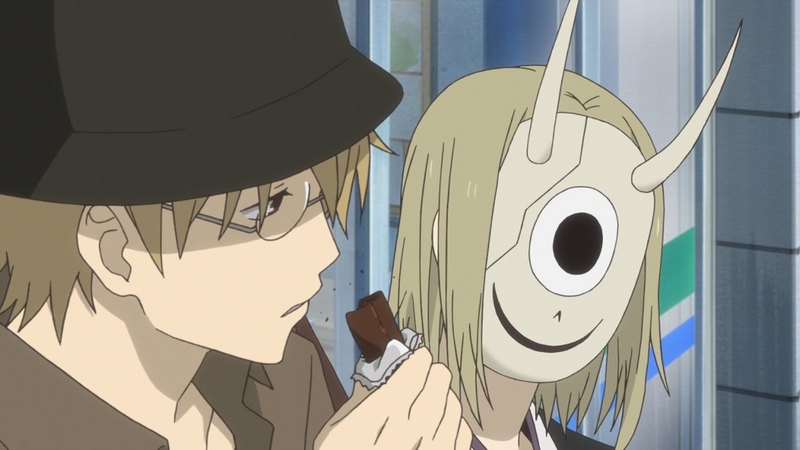 This is Natsume’s show of course so I wouldn’t like it if the series did that on a regular basis. In the end this wasn’t episode 7 so I will simply be covering it from the perspective of the OVA type episode that it ended up being. Which is appropriate since is an OVA that came out back in 2013 that they decided to air this week. Not to say everything fell off the cliff with this episode. The visuals were still up to the good quality the show has always had. All the core structure of the show remained well done. This episode just lacked a lot of the things that has made Natsume great. There wasn’t the same emotional punch that many episodes had or really even character development. Nyanko Sensei can be the main focus of an episode; I think they had an episode like this in the past. But…did he develop at all? I don’t think he was ever the type to leave a couple helpless kids to die in the woods. The kids certainly didn’t develop. From the preview I thought this episode could be good. But the episode itself didn’t pull through for me. 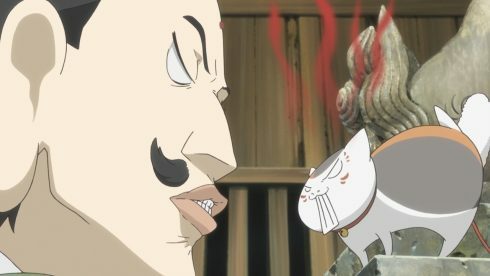 This may be one of the first times I have ever looked at the timer during a Natsume-related episode and felt bad that it was only half way over XD. This was just a tough episode in a lot of ways and all of that goes to the kids. I’m sorry….those kids were annoying. Certainly I think the show hit a realistic tone with very young children but in the worst way. 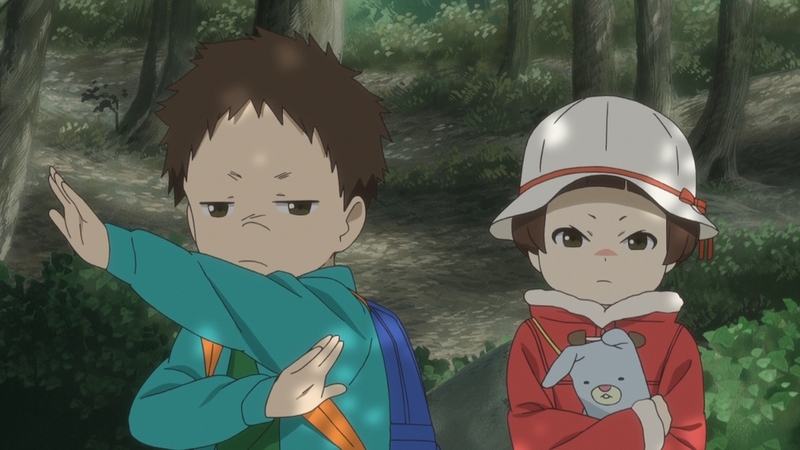 These kids nearly got themselves hurt or killed several times in the episode. 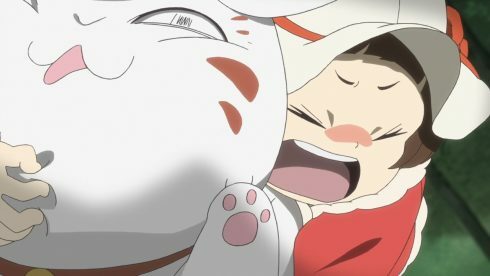 On top of that they were quick to cry and a real chore for Nyanko Sensei to take care of. Realism can be fine, but these kids just dragged the episode down. It’s fine to be on point, but couldn’t they just have been a bit older and yet lost in a similar fashion? Also…shame on that mother. She is unbelievably lucky her kids weren’t lost in the woods or dead. These kids aren’t even old enough to pronounce the name of the store they are visiting! It took until Natori was at the store that I put together where they were trying to go. To be fair I don’t have kids so maybe I’m just nuts, but whom sends out kids that young out unsupervised? How old were those kids? 6? 9? 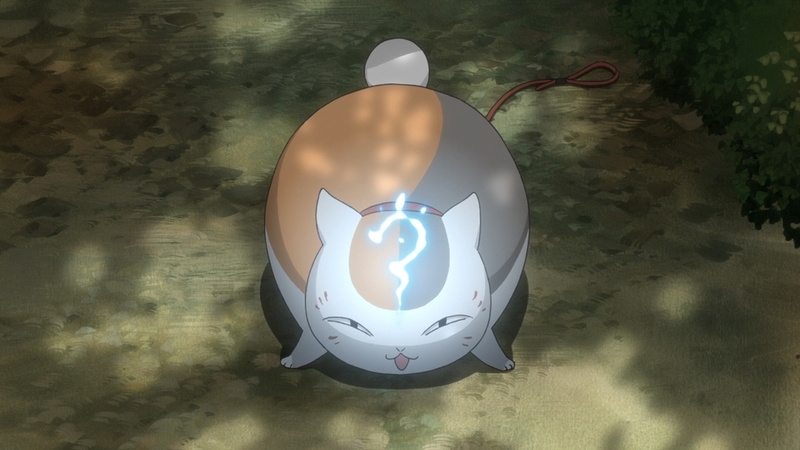 Oh great she was worried at the end, but frankly without Nyanko Sensei finding them when he did…those kids are dead before the search parties are even sent out into those woods. Maybe that sounds dark to say, but that’s the reality of this episode. That situation wasn’t cute, it was life threatening. There isn’t that much to say about this episode. Nyanko Sensei finds some kids, deals with how annoying they could be and eventually they make it to the store alive. 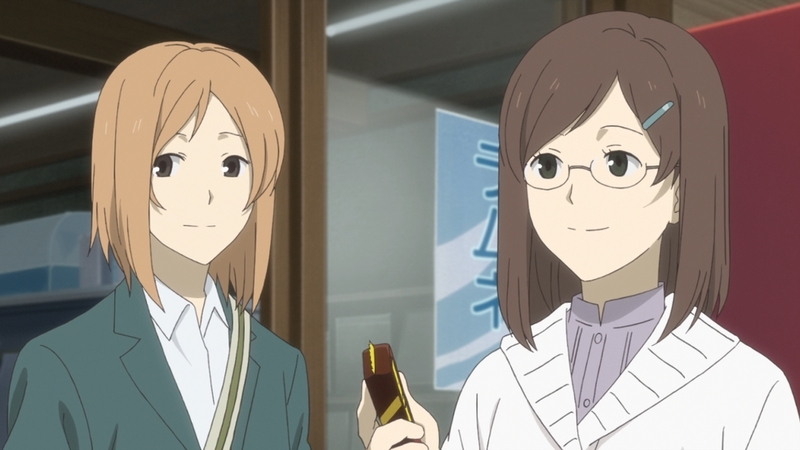 Occasionally the focus would cut to either a character we know exiting a local store or Natsume looking for Madara. That could have been fine, but unfortunately they were repeating the same jokes over and over. Yes, Nyanko Sensei is fat! We get it! And sure we get that the kids are quick to cry and are quick to be distracted. Repeating the same jokes isn’t that much fun when the jokes weren’t exactly great ones to begin with. 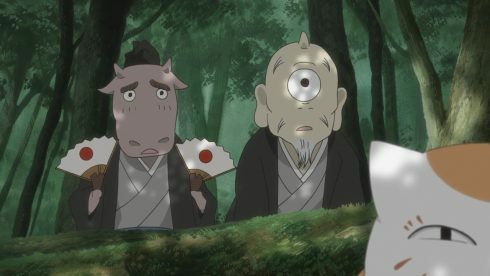 Sure there is some fun in seeing Madara interact with various recurring youkai characters. But those moments are fun in just a standard episode. It’s not like there was anything new in these encounters. He still fought with the Mustache guy as per the norm. The interactions were fine, but not particularly funny. 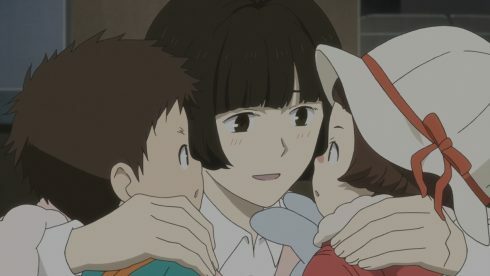 I suppose some could find this a cute episode. Nyanko Sensei has to deal with some kids and get them safely to their destination. For me it simply was a bit of an annoying episode. The reality of that situation didn’t help anything either. 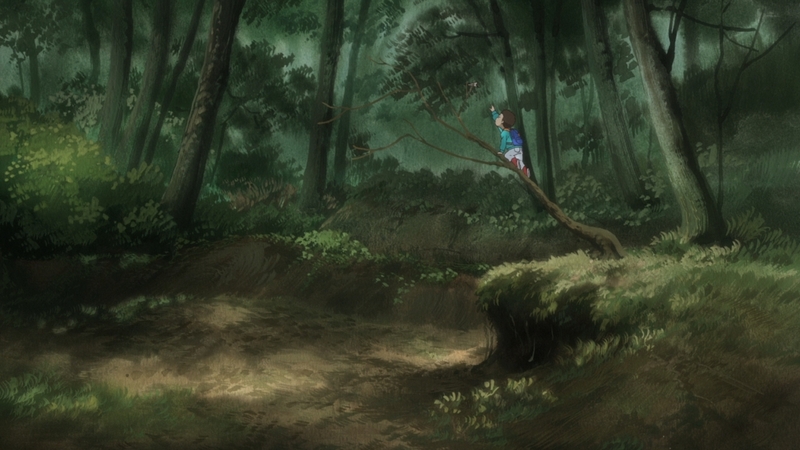 Something could have hurt those kids; be they animals, youkai, or accidents. Good for them that they are safe. At least they managed to avoid getting hurt. 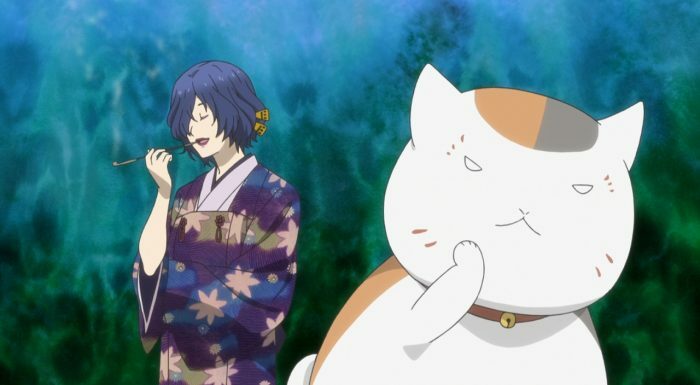 And at least they avoided hazards before Nyanko Sensei stumbled on them. All I can really say is that for me these kids were pretty annoying and the episode felt longer than it should have been thanks to this. I’ll be glad to get back to the normal episodes and let this remain in the past. I just truly hope that mother learned her lesson. She was so lucky they ended up being safe. Good thing that Madara isn’t the type to go snacking on children which was something most of the other youkai seemed to be ok with….the world is a dangerous place. No doubt about that.